Note: For network status information, see Status indicators. Presence, status, and activity let others know immediately whether you are available for a call or chat. You can Change your presence and status and add a custom message to provide more information about your status. Along with presence and status, PureCloud also displays your activity, such as when you are on a call, and your location. PureCloud always shows your Activity, but you can choose to Share your current location. Besides showing other users whether you are available, status also controls when you receive notifications and calls. For example, if your status is Busy, PureCloud sends all your incoming calls to voicemail. If your organization has contact center features enabled, you may have to select a secondary status after selecting a primary default status. Administrators in your organization create secondary statuses to provide them with more details about your availability and activities. For example, if you are making calls to customers, you could select Busy as your primary status and Customer Calls as your secondary status. Other users can only see your primary status, such as Busy, and cannot see your secondary status. Administrators can see secondary statuses in the following reports and views: User Status Detail report, Queues Activity Detail view, and Queues Detail view. Presence indicators appear as colored rings around profile pictures. Available, green You are online and available for calls or chats. Busy, red You do not want others to interrupt you. PureCloud sends all calls to voicemail and does not alert you to requests for video chats. Other users cannot start a one-to-one video chat with you. Away, yellow You are away from your computer. You can set your presence to Away manually. If you use the Desktop app, PureCloud also changes your status to Away when your computer screen locks or changes to a screensaver. Note: If you manually change your status to Away, PureCloud allows you the opportunity to answer calls before they route to voicemail. However, if, due to inactivity, PureCloud automatically changes your status to Away (Idle), it also sends calls directly to voicemail. Break, yellow You are taking a break and are not working. PureCloud sends all incoming phone calls to voicemail. Meal, yellow You are taking a meal and are not working. PureCloud sends all incoming phone calls to voicemail. Meeting, red You are in a meeting. 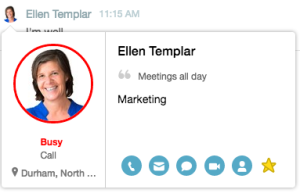 PureCloud sends all incoming phone calls to voicemail and does not alert you to requests for video chats. Other users cannot start a one-to-one video chat with you. Training, yellow You are in training. PureCloud sends all incoming phone calls to voicemail. Out of Office, pink You are away from the office and not available for calls or chats. PureCloud sends all incoming phone calls to voicemail. If you log out while set to Out of Office, the Out of Office status remains. Out of Office and Offline, gray You logged out of PureCloud and are away from the office. You set your status to Out of Office before you logged off PureCloud. PureCloud sends all incoming phone calls to voicemail. You logged out of PureCloud. When you log out, PureCloud automatically sets your status to offline. PureCloud sends unanswered incoming phone calls to voicemail. Note: If you have your default phone selected as your phone, you log out, and your status is Offline, then PureCloud sends calls to your default phone. Despite being offline, users with non-WebRTC phones can still answer incoming calls. However, offline users with WebRTC phones do not receive notification of incoming calls. Ask your administrator if you are unsure which phone is your default phone. Changing your status while you are in a call or other interaction does not affect that interaction. If you lose network connectivity, you appear offline to other users. When connectivity returns, you appear as Available, regardless of the status you had when you lost connectivity.